ArcPad is used on PDAs to facilitate data collection and management. ArcGIS Desktop helps maximize resources by narrowing focus area. Use of GIS increases probability of success in detecting newly introduced pests. Florida has steadily grown into a major U.S. hub for international commercial trade and tourism, which has significantly increased the risk for the introduction of plant and animal pests and diseases. The Sunshine State enjoys a warm and humid climate year-round, which is favorable to the establishment of exotic pests and disease. It is also located within a major pathway of wind currents and storm events, elevating the risk of windborne pest and disease introduction. With 30 ports of entry and four major air traffic hubs, Florida represents a high-risk pest gateway for the entire United States. In fact, Florida is referred to as a sentinel state for exotic pests. The number of tourists entering Florida in the last 10 years grew 20 percent while perishable cargo nearly tripled to more than 6 million tons. More than 85 percent of propagative plants imported into the United States arrive at Miami, the port of entry declared to have the highest number of pest interceptions nationally each year. Aerial map with survey sites. If infested plant and animal materials evade U.S. Customs and Border Patrol inspection measures and are released into the environment, there is a high risk of pest establishment. Invasions by nonindigenous species cost U.S. taxpayers hundreds of billions of dollars due to environmental degradation, lost agricultural productivity, expensive eradication efforts, and increased plant health problems. The frequency at which exotic organisms have entered Florida via the plant and animal material carried in by tourists and on cargo has increased during the past decades. Since 1981, approximately 500 new U.S. and state detection data records for plant pests have been established in Florida. The Cooperative Agricultural Pest Survey (CAPS) Program, a combined effort by state and federal agricultural agencies, conducts surveillance, detection, and monitoring of exotic plant pests of agricultural and natural plant resources as well as biological control agents. The program's major goals are early detection of pests before establishment, collection and management of survey data, and determination of areas of possible elevated risk. Faced with the goal of visualizing critical data and improving survey detection, CAPS has incorporated GIS-related applications. The Florida CAPS Program has used ArcPad software on personal digital assistants (PDAs) to facilitate data collection and management and allow geographic information to be available in the field. The program had been using other Esri products, and ArcPad was selected since it allowed for out-of- the-box functionality with only minor modifications for each field survey program. Each survey initiative entails the development of location maps based on the "hot zone" approach, which integrates spatial risk information from various sources to target areas of highest susceptibility for pest introduction or establishment. With the help of ArcGIS Desktop, spatial data related to high-risk areas, such as agricultural produce and commodities, permit holders, seaports and airports, parks, and nurseries, has been identified, while a pattern is being developed of likely locations for pest introductions. A recent example of this type of survey planning involved the red palm mite (RPM), Raoiella indica, a pest of several commercially important palm species. The potential of RPM to be spread from the Caribbean via wind currents results in all of South Florida being at risk for introduction. 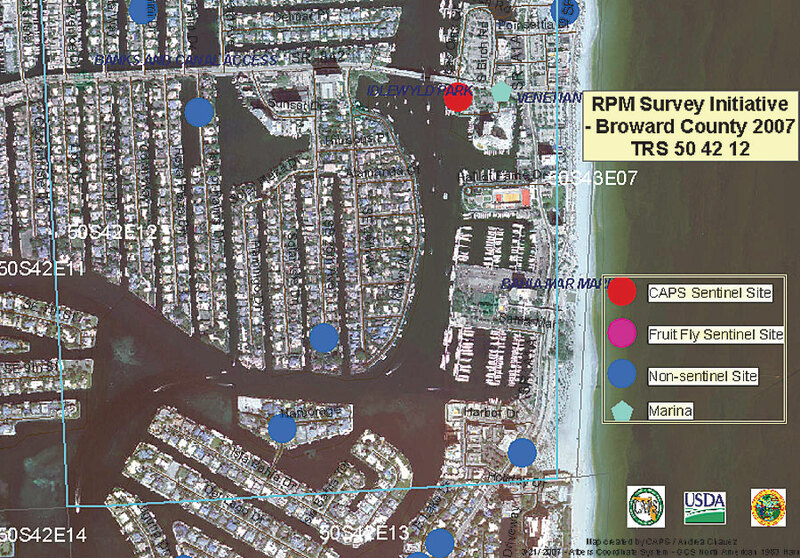 Identifying additional pathways has allowed CAPS to determine likely hot zones for the introduction of RPM in Florida, such as private marinas and commercial palm nurseries, reducing the total area required to be surveyed and increasing the potential for detection. Aerial reference maps allowed surveyors to target high-risk areas for survey, and the use of ArcPad facilitated their real-time position via GPS in relation to high-risk locations. Required location data was available in ArcPad as map layers, including street names and township/range/section. GPS information was automatically captured and linked with data supplied by the surveyors. Surveyed sites were displayed to assist surveyors in distributing sites throughout assigned areas. CAPS has conducted surveys at 1,559 locations in 12 counties in South Florida, with the vast majority (62 percent) of the sites in the highest-risk areas of Broward and Miami-Dade counties. 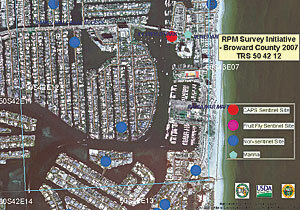 RPM was detected in two southeast Florida counties in December 2007 as the result of a sentinel survey established by CAPS in cooperation with state and federal Fruit Fly Detection personnel. Sentinel sites continue to be monitored and the results mapped using GIS to assist in regulatory decision making. The Florida CAPS Program used GIS to develop a successful survey to detect citrus greening, one of the most serious diseases of citrus. When the survey was initiated, citrus greening was known mostly from Asia and Africa. Analysis of demographic data based on the U.S. census identified high-risk areas for introduction of citrus greening via smuggling of citrus plant material. Residential properties containing specific susceptible citrus varieties within these high-risk areas were identified by obtaining data from the existing Citrus Canker Eradication Program. In addition, high-risk farms were identified for survey. GIS tools were effectively applied from the start of the survey initiative and facilitated operational planning. PDAs were used for collecting and managing survey data. "GIS technology enables us to organize innumerable data visually and identify hidden patterns within the data," reports Eduardo Varona, United States Department of Agriculture (USDA) state operations support officer in Miami. "This is invaluable, as it empowers survey planners to better allocate limited resources." After citrus greening was detected in Florida in late 2005, delimiting surveys were conducted by state and federal personnel under a unified Incident Command System (ICS). GIS software and hardware were mobilized to ICS command posts, and data on commercial citrus groves was added. "Surveyors are now able to precisely locate themselves in a grove in order to achieve the survey distribution goals set for the project," says Joseph Beckwith, area manager for the USDA Smuggling Interdiction and Trade Compliance Program. This enabled delimitation of a disease newly established in Florida. Areas under quarantine for citrus canker were displayed on PDAs as a GIS layer, and real-time location via GPS allowed surveyors to avoid entering these areas. "With a minimal amount of personnel resources," Beckwith continues, "GIS enables us to maximize those resources by narrowing our focus area. This gives us a higher probability of success in detecting newly introduced pests before they reach economically damaging levels and enabling a greater opportunity for eradication." Pest detection initiatives require quick prospective delimitation efforts. So far, ArcGIS Desktop and ArcPad have set the tone for quick, flexible, and cost-effective survey planning. As Dr. Wayne Dixon, Florida CAPS Program manager, states: "GIS has allowed us to better channel our survey resources to the right places and made finding the proverbial 'needle in the haystack' much more likely." For more information, contact Andrea Chavez, GIS mapping specialist, Florida Department of Agriculture and Consumer Services (FDACS) (e-mail: achavez@ufl.edu); Doug Gaskill, pest survey specialist, FDACS (e-mail: gaskild@doacs.state.fl.us); Trevor Smith, CAPS state survey coordinator, FDACS (e-mail: smitht2@doacs.state.fl.us); or Wayne Dixon, CAPS Program manager, FDACS (e-mail: dixonw@doacs.state.fl.us), or visit www.doacs.state.fl.us/pi/caps/index.html.